George Gibson (1904-2001) was born in Edinburgh, Scotland in 1904, he received his arts education at the Edinburgh College of Art and at the Glasgow School of Art where he studied with the master scenic designer William E. Glover. Realizing that his talents and motivation were in scenic design, Gibson worked as an apprentice in local theaters while completing his studies. In 1930, he emigrated from Scotland to the United States and settled in Los Angeles. In 1934 Gibson landed a position as an illustrator with Metro~Goldwyn~Mayer Studios. 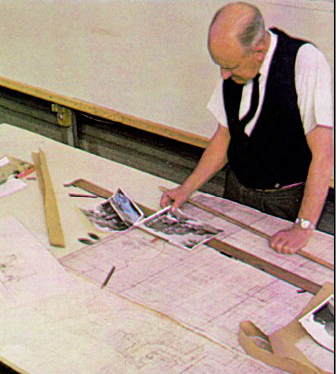 By 1938 he became head of the scenic design department. Through his more than thirty-year career, he worked on such films as Boys Town (1938), The Wizard of Oz (1939), An American in Paris (1951), Brigadoon (1954), and Shoes of the Fisherman (1968). Gibson’s backdrops were as large as 60 x 150 feet and so realistic that the audience didn’t realize the setting was on a soundstage, which was the goal of the studio. After serving in the United States Marine Corps in World War 11, Gibson began to exhibit his watercolor paintings on a professional level. In the late 1940s, Gibson was on the board of the California Water Color Society and in 1951 was the Societys president. After his retirement from MGM in 1969, Gibson was able to devote all his time to painting and teaching. He loved painting out of doors with watercolor. Posted on 5 November, 2018 by Domingo Lizcano. Permanent link.